It's time for some fun alphabet crafts!! We hope you enjoy these! If you are new, you can visit our ABC webpage to find links to any other letters we have done! Summary: Nipper is a little crab with BIG claws that get in the way all the time. When he tries to play hide and seek they always give him away. His big claws come in handy though when his friend Octopus gets tangled in some seaweed. 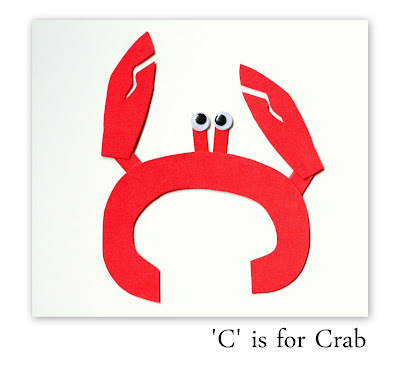 My little boy loves crabs and now is begging me to do this craft. You have put together such an incredibly fun and creative set of Alphabet crafts. I am hosting a new blog collaboration called The Ultimate Alphabet Craft Collection. If you would like to link this idea up, you are more than welcome. We would be honored to have it.